With over 9 million customers and an annual revenue of 1.2 billion euros, bol.com is the biggest ecommerce platform of the Netherlands and Belgium. In 2018 I was appointed as Lead Designer, on behalf of Soda Studio, to contribute to the growth and the optimization of bol.com’s iOS and Android apps. bol.com, sometimes called the Amazon of the Benelux, currently has over 16 million products, works together with external sellers and offers several subscription services. Founded in 1999, bol.com now has more than 9 million active customers and sells over 16 million products. 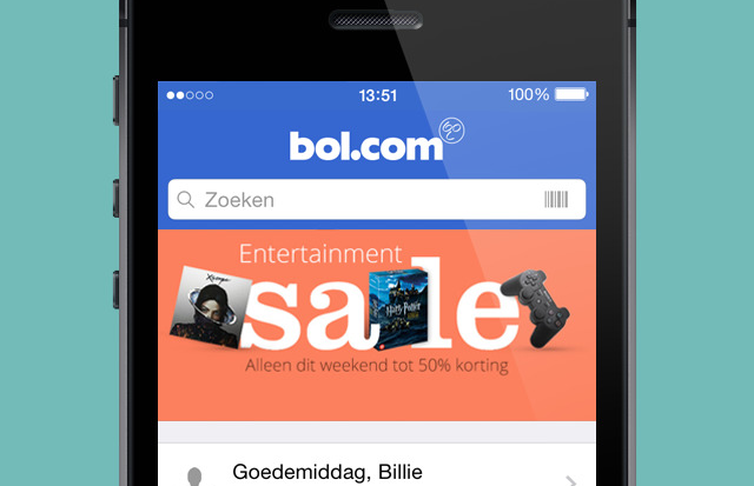 Being the biggest ecommerce platform of the Netherlands and Belgium, bol.com introduced its mobile app for both iOS as Android back in 2014. However, in the years that followed, the app never really secured the intended influence both internally as on the market. Read the article about the launch of the bol.com app on Dutch blog iCulture. The ultimate goal was to make the bol.com app the number 1 shopping app of the Netherlands and to innovatively respond to the increasing amount of mobile users. My job was to contribute to achieving that goal. When I joined the app team, I was being tasked with leading and delegating all app related design efforts, as well as optimizing internal workflows. Through several changes in the way of working and by setting up a consistent design library we were able to improve the collaboration with the development teams and to increase the velocity of the design team considerably. Read more about the optimized workflows and design projects I worked on. Besides supervising and initiating design projects, such as the in-app live chat, improvements for the search/browse flow and rethinking the product detail page, I have also been involved with improving the webshop and worked closely together with the other design teams. After introducing the new bol.com app we have seen a considerable increase of mobile users. As of 2018, the app is the market leader in retail in terms of reach. With a reach of 17,6% bol.com is the market leader in terms of the reach of its app. The reach of the app has increased with more than 220% in the past 2 years and it has an average rating of 4.5 stars in both the App Store and Google Play, based on over 100,000 reviews. With the redesign, the app got its intended influence - not only on the market but also internally. With the introduction of the new visual style of the app and dozens of new features, the aim is to make the app even bigger in 2019.